The official Government and Legal notices for today [Feb 8] include the Attorney General’s Chambers’s contracts valued at $50,000 or more, planning applications, Power of Minister to require information as to ownership of premises and more. Applications registered between 2/1/2019 and 2/7/2019. Objections to applications must be received within 14 days of the date advertised [February 22, 2019]. Any person wishing to object must do so within 14 days of the date of this publication [2/8/2019]. Proposed Internal Conversion to Create 3rd Dwelling Unit. Proposed Demolition of Existing House and Construction of New 2 Dwelling Unit House [2 Units Total], [Previously Approved Under P1030/04 - Expired December, 15, 2018]. Proposed New Dock House, Floating Dock and 6 ft. High Chain link Fence along Right of Way. Proposed New Dwelling Unit via Internal Conversion [2 Units Total]. Proposed New 1 Bedroom Dwelling Unit [2 Units Total]. Proposed New Driveway Gate and Boundary Walls [6 ft. High]. Proposed Renovations and Additions to Create New Kitchen, Living Room, Master Bedroom. Garage and Pool Area. Proposed Creation of New 4 Bedroom Dwelling Unit with Garage from Existing 2 Bedroom Dwelling Unit [1 Unit Total], New Cesspit and Boundary Walls [4 ft. High] and Retaining Wall [10 ft. Max Height]. Proposed Internal Renovations to Reduce Number of Dwelling Units from 3 to 2 [2 Units Total], New Master Bedroom, Bathroom and Closets, Laundry, Storage Shed, Cesspit, Tank and Exterior Stairs, Excavation and Rock Cuts Supported by Retaining Walls [Max Height 9 ft.]. Proposed Alteration of Existing Right of Way from Tucker’s Point Drive to Lot 9 Paynter’s Hill to Improve Access to the Golf Course and to Provide Emergency Vehicle Turnaround. Proposed Boundary Adjustment and Amalgamation of Lots 9-1, 1 Glebe Hill, Hamilton and St. George’s Parishes [Revising S0026/12]. Proposed New Dwelling Unit [3 Units Total], New Swimming Pool, Basement Storage, 4 ft. High Retaining Walls, 3 ft. High Timber Fence and New Cesspits. 1. This Notice may be cited as the Public Access to Information [Information Statement- Contracts Valued $50,000 or More] The Attorney General’s Chambers Notice 2018. Made this _7th day of February, 2019. And for the purpose of enabling her to carry out any of her functions under this Act, requires the occupier of the premises at 25 Barry Road, St. Georges, Bermuda, GE 04 and any person who directly or indirectly receives rent in respect of these premises, to state in writing the nature of his own interest therein and the name and address of any other person known to him as having an interest therein, whether as freeholder, mortgagee, lessee or otherwise. The property is currently unoccupied. The last known owners were Mr. Abel Amos and Lorraine Elsie Farrell. One “Screen Machine” sand sifter for the processing of sand. This application is available for inspection at the Department of Environment and Natural Resources during normal working hours. Any person wishing to object to the proposed plant may, within 14 days of the date of this publication, lodge their objection with the Department of Environment and Natural Resources, 169 South Road, Paget DV 04.
Letters of objection must state the name and address of the objector; the grounds of the objection; whether the objector has an interest in land near to that which the application relates; and be signed by the objector. This application is available for inspection at the Department of Environment and Natural Resources during normal working hours. Any person wishing to object to the proposed plant may, within 14 days of the date of this publication, lodge their objection with the Department of Environment and Natural Resources, 169 South Road, Paget DV 04. Letters of objection must state the name and address of the objector; the grounds of the objection; whether the objector has an interest in land near to that which the application relates; and be signed by the objector. 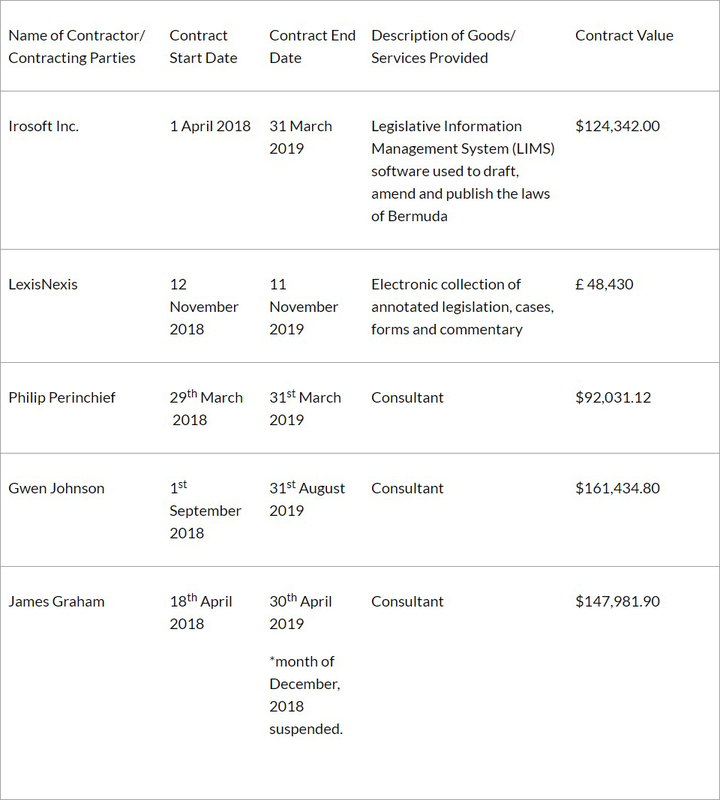 In The Matter Of Sousa’s Landscaping & Floricultural Co. Ltd.
Take Notice that the Supreme Court of Bermuda made an Order on the 7th day of February, 2019 in respect of Sousa’s Landscaping & Floricultural Co. Ltd. – In Liquidation [the “Company”] for the release of the Liquidator and dissolution of the Company. Sousa’s Landscaping & Floricultural Co. Ltd.